Luego de inatalar la nueva versión (hoy mismo realicé otro intento) al abrirla aplicación me aparece un mensaje de error. Se los adjunto. Muchas gracias por todo, MuseScore es la mejor, SÓLO LE FALTA UN vIRTUAL SINGER!! After uninstalling the new version (today I made another attempt) to open the application I see an error message. I attach them. Thank you very much for everything, MuseScore is the best, ONLY YOU HAVE A VIRTUAL SINGER !! Not sure why that message might show after uninstalling MuseScore 3? Or is that a translation glitch? (and no, we do not have a virtual singer, not sure why you beleive we have? 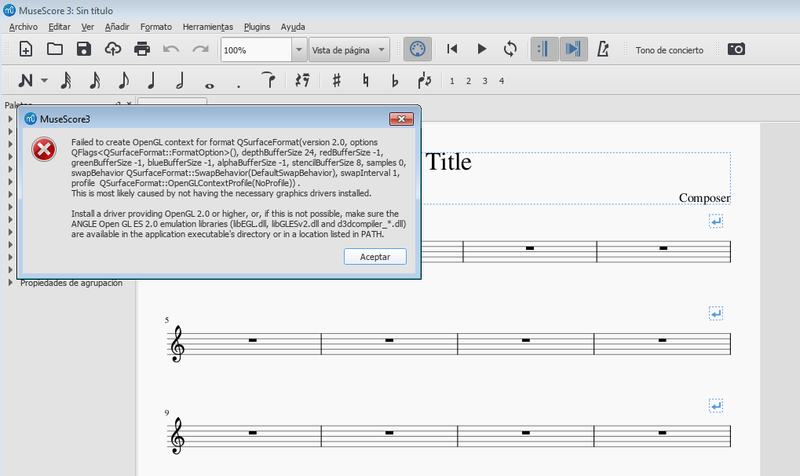 The DLLs mentioned in that error message are part of the MuseScore 3 package, found inside the MuseScore 3\bin\ directory, so I don't understand why those are not getting found and used? Can you try installing todays MuseScore 3.0.1 and see whether that runs? BTW, this seems not impossible to install version 3, error message bit impossible to run it, right? I'm afraid google translate mistranslated several things, and I also expressed myself badly. The problem does indeed come up when attempting to run MuseScore 3, not when attempting to install it. I've installed MuseScore 3.0.1 and the same message comes up when attempting to run it (and then the program shuts down). Two of the three libraries it requests are there, but the third (d3dcompiler_* ) isn't. I'm attaching two screenshots with the folder's contents . Do you know why it would be missing for me, or any way I could fix it?